1.) Drain tofu package and put tofu on a few layers of paper towels to absorb "tofu juice". 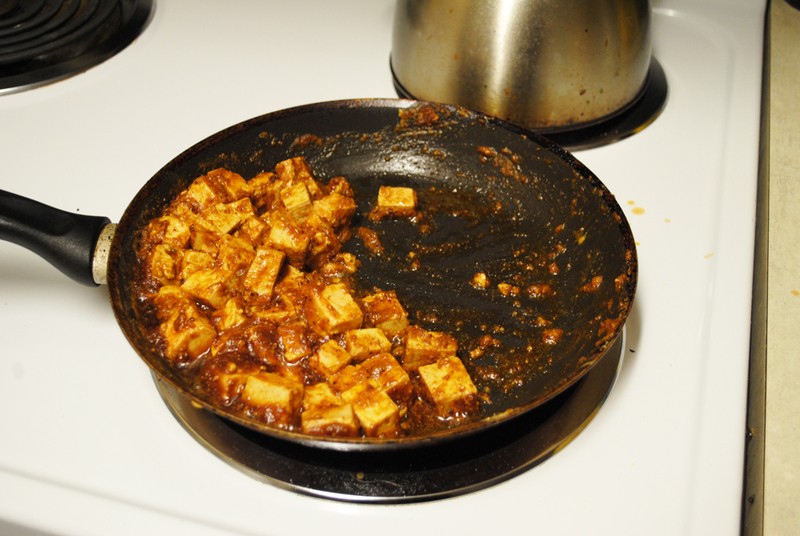 Flip over tofu and use paper towels to continue "drying" the tofu. 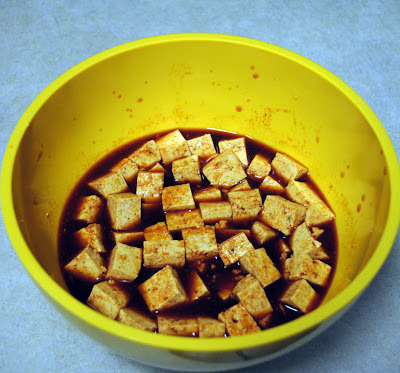 By taking this liquid out of the tofu cubes, the tofu will be more porous and more willing to take in marinade. 2.) 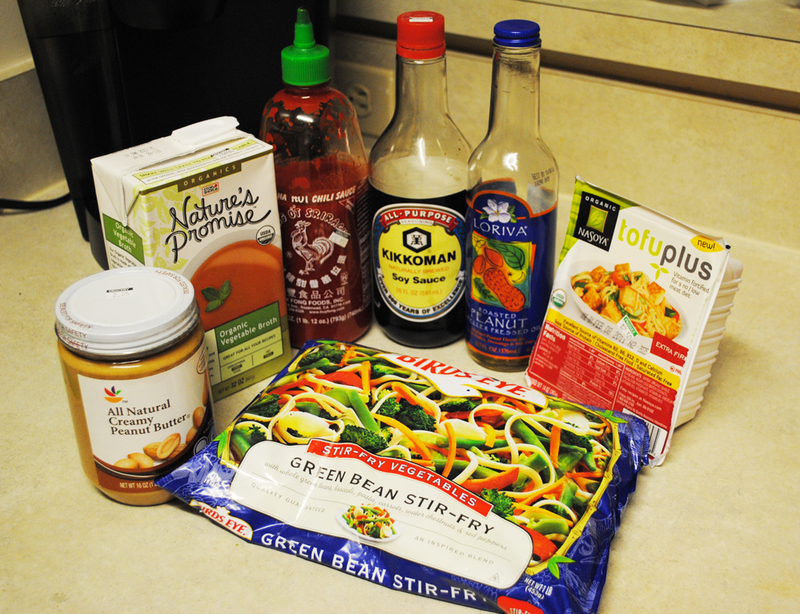 In a medium sized bowl combine vegetable broth, soy sauce, and Sriracha sauce. Add tofu cubes and let soak for at least 10 minutes. 3.) In a nonstick pan, add peanut oil to cover and heat over medium-high heat. Right before putting in the marinated tofu cubes, add a tablespoon or so of peanut butter and spread evenly over pan. 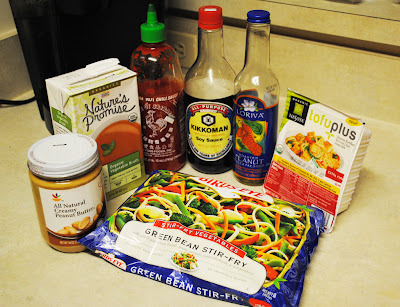 **At this point you should probably start cooking the frozen stir fry. 4.) While cooking spoon a spoonful of marinade mixture on top of tofu. Cook all sides of the tofu (do the best you can, lol) until brownish. 5.) 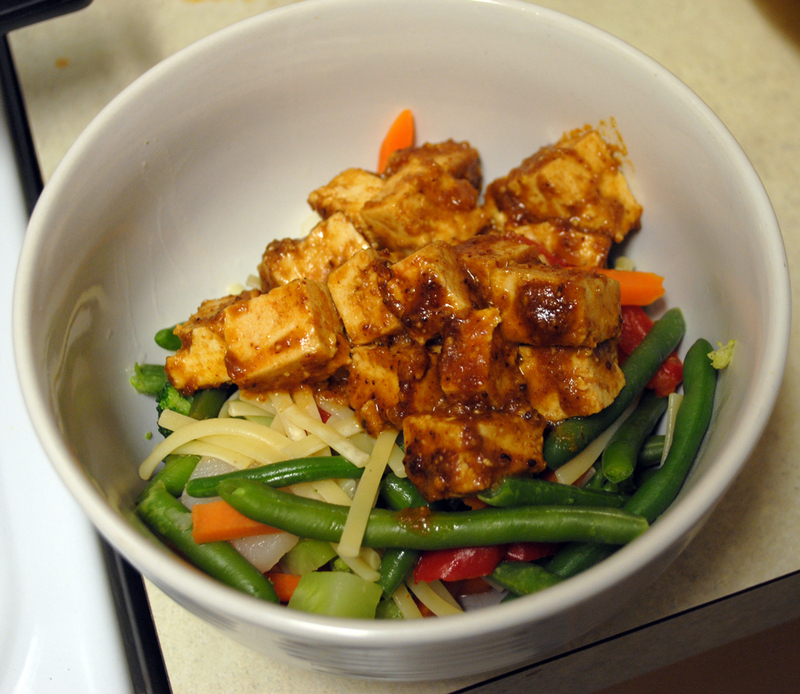 Serve tofu over stir fry. Serves 2. I had never been into tofu before trying this dish, but this recipe is pretty awesome. Okay, I've been trying to find a tofu dish my husband will eat, and I think this is it. He would probably bathe in peanut butter if he could. Thanks for sharing! This looks SO good and so easy! I made tofu curry last night (one of our staples) and it's pretty time consuming. Can't wait to try this! I'm all for cheap and tasty! I'm going to have to try this one!